I have been using the normal tethers with quick release, I can't complaint too much about the motion constraints, but the sliding tether appears to be a nice feature - any comments? Negatives/ Positives? I have the non-sliding ones. How does one convert? Super easy. You unscrew and remove the mounts that hold the tethers in place. The sliding tethers come with a new set of mounts for the tether that allows them to slide which use teh same mounting spots. If you have the older style HANS posts which is pretty likely you should replace the washers on the inside of the helmet which is also very easy to do. 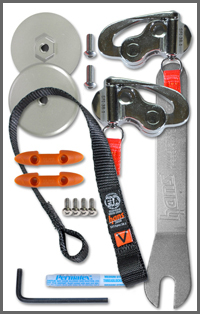 Hans also has a new sliding quick release tether system that will be released next month. Exactly why I got rid of my quick releases. The sliding tether is fantastic. I cut the QR straps so they are not long enough to get caught under the shoulder harness but still long enough to grab even with gloves on. Good tip, I think it is a wise recommendation. I love the sliding tether! I started out with the original fixed tethers, and switched out shortly after. The sliding tether is so good I don't even notice I have the HANS on. There's no snagging or stopping. I wear a Hutchens Hybrid (LOVE it, but that's another thread!). I have quick releases on mine & simply have the tethers velcroed to the front of my helmet. Buckle in, stick tethers to helmet, drive. 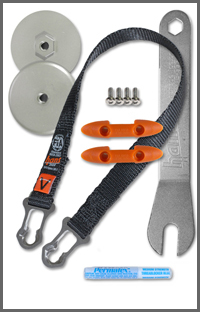 They don't get caught near the belts & are right where I need them, IF I ever need them! Agreed; replaced my QR tethers with the sliding tether kit before last weekend at Sebring, and the slider is a great improvement. Anyone have any idea when the rumored quick release sliding tethers are going to be available? Looks like the old-style helmet mounts are obsolete. I have looked at them at PRI, but have not had the chance to try them. I was told at Sebring last week that they have been delayed until late April. I ran the QR before. Honestly, I would never go back to them. I have the sliding tethers. Just find a way to get out of the car without disconnecting. I have a Racetech HR seat. I have found that I can slide my hips forward and go right out the left side without disconnecting. Mark is talking about the new combination quick release/slider where the quick release attaches to the helmet. I have the sliding tethers which are great...the new system combines the advantages of the sliding tether with a quick release system. George at Speedcom told me he hopes to have them for the May National/ECR at Daytona. Thanks Paul! I guess nobody has gotten them yet. I don't see the "old" quick release upgrade kit on their website, so I am guessing they are replacing that with the Quick Link. As per the comments above, I don't think the "old" quick release was widely liked. The Quick Link tether upgrade is $35 more than the standard. Whoever gets one and gives it a try, let us know what you think! George told me he had never sold the old quick release to a miata driver...only the sliders. The part I don't like is that I bought the slider in October. I've used the original quick release for 3 years and love it. Makes getting in and out of the car much easier for me. I had the quick releases on my original tethers, got rid of them when I went to the slider. I decided that I was nearly as quick at unlatching the tethers as I was pulling the cord. I got a set of the quick release sliding tethers directly from HANS earlier this week, so they are in retail channels now. I haven't actually used them yet, though, so I can't comment on how they work. Does anyone happen to know how much the standard HANS helmet anchors weigh? I just picked up the sliding tether upgrade, and got the "Quick-Click" style anchors. According to the kitchen scale the "Quick Click" anchors weigh 2 oz. each. They do look easy to use and strong. But I am curious to know how much more they weigh than the standard anchors. I installed the quick release slider last month. the new releases are definitely heavier! How many folks have bought the Quick-Clicks? Any +/- recommendations? I have the Quick-clicks with the slider. I am going to change the orange pulls for the longer style. Other than that I like them. Sliding, quick-clicks from the beginning (guessing 7-8 events) and I couldn't imagine what wearing a HANS would have been like w/o them! Only complaint I have is I can't look over my right shoulder to check while backing up but that's what you have "crew" for, eh? Regarding the pulls/releases - I've not had them get caught under the belt or device so can't confirm what others have experienced. Just used mine for the first time this past weekend, only issue was that I got ahold of one of the orange release straps once when buckling my helmet and released one side of the tether, otherwise no problems, great head movement.